Sieve in 8oz plain flour. Whisk in 1 pint of milk to make a smooth batter. Add some butter or oil to a frying pan and pour in some of the pancake mixture. Fry over a gentle heat for a few minutes then flip and fry on the other side. What do you serve with your pancake? We love lemon and sugar! 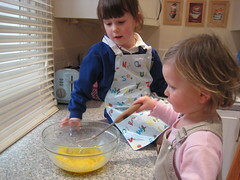 Set up a pancake kitchen role-play: use your toy cooker and set up a kitchen corner where the children can have fun making pretend pancakes and serving them to each other. I always find children love to use ‘real’ things from the kitchen, rather than toy utensils, so lend them some items from your kitchen if you can. You can include: a frying pan, wooden spoon, mixing bowls, jugs, milk cartons, sieve, egg boxes, aprons. You could make a pretend pancake too (from cardboard or use a beanbag) and see if they can toss them and catch them in their pan – great hand-eye co-ordination practise! Include some gross motor skills fun and get the children on the move with a pancake race. 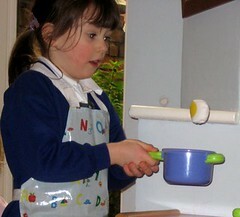 Each child needs a pan and a pancake. Line them up on the starting line and see if they can walk, run, hop or skip their way to the finish line, tossing their pancake as they go – but with out dropping it! How about a pancake day craft? Shrove Tuesday is celebrated in many countries as Mardi Gras with a big carnival procession. So why not make some carnival masks and hold you own parade. Use our simple child’s mask template to cut a mask shape from some card and then let the children customise their masks with a creative design. Provide glue, feathers, scraps of paper, stickers, ribbon, crayons and glitter and let them take their pick. Fasten a thin piece of elastic thread to either side of the mask (held in place with sticky tape or staples) and they can wear their masks and go on a carnival parade. Any other ideas for pancake day? How are you celebrating Shrove Tuesday? 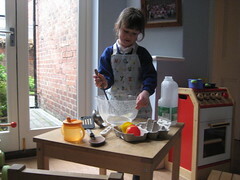 oh loving the idea of a home corner pancake play!! Will definatly be adding that to the weeks planning! Ohhh…. and we love sugar and lemmon too!!! Can’t beat sticking with tradition Pip! We made masks at Playgroup! Definitely fab for Mardi Gras and Pancake day! Love all the Kitchen Roll play too! Traditions are important to keep up, even more so when you are living abroad. We are lucky to have two sets of traditions- English and Estonian. You made masks! I’m linking up for my Mardi Gras Post. I hope to post Saturday morning but we are going to try to make Mardi Gras Pancakes too so maybe by the afternoon! Thanks for the link!